Have you suffered an occupational illness? According to the U.S. Occupational Safety & Health Administration (OSHA), lead overexposure is one of the most common types of work-related overexposure in America. Most cases of lead overexposure are found in industrial jobs. Because of this OSHA has made eliminating lead exposure from the workplace a priority. With a five year strategy, OSHA plans to reduce lead exposure in workplaces across the United States by 15%. Lead exposure is a public health concern, too. Lead is the leading cause of environmentally induced illness in children, and can be found in paint, urban dust and folk remedies. Studies have shown that children under the age of six are especially susceptible to illness related to lead exposure. This is due to their rapidly changing neurological and physical development. If you have been exposed to lead, you may suffer serious adverse side effects. Lead overexposure may occur after a short amount of time - even a period of several days. There are two types of overexposure: acute and chronic. If you begin to develop symptoms after several days of exposure, you may be suffering from acute lead overexposure. If your symptoms are the result of years of exposure, you may be suffering from chronic lead overexposure. Lead may be found in a multitude of substances and specific occupations put workers at a higher risk of exposure than others. Lead production, smelting, demolition, lead fishing weight production, steel bridge maintenance, sanding or stripping old plain, batter manufacturing or recycling, scrap metal handling, home renovation or remodeling, firing range jobs, radiator manufacturing and other occupations may put workers in increased danger of developing overexposure symptoms. There are a variety of precautions that workers can take to avoid lead overexposure. For instance, washing your hands and face before you eat or drink may reduce the risk of suffering from overexposure. Never eat in an area that you believe may contain lead. Talk to your employer about overexposure; make sure that your workplace is up to OSHA standards so that you are not unnecessarily exposed to too much lead. If you know that a certain area contains lead, avoid stirring up dust in that area. If your occupation exposes you to lead, there are precautions that you can take to protect your family. For example, always keep your street clothes and your work clothes separate; do not wear your work clothes as street clothes. Keep your street clothes in a clean space - away from your work clothes. Never wear your work clothes in your home. If at all possible, avoid going home before you have showered. If you are able, wash your work clothes at work. If your work does not provide a facility for you to launder your clothes, wash them at home separately from your street clothes and your families clothing. If you believe that your occupation has exposed you to an unnecessary amount of lead, your medical expenses may be covered. Are you suffering illness because of overexposure at work? Call our firm today. 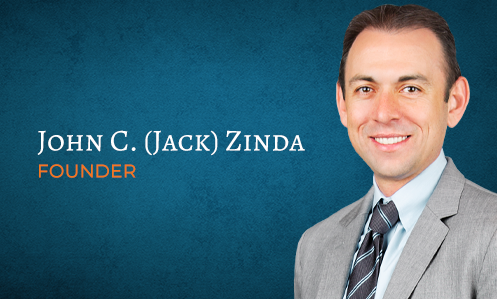 At Zinda Law Group we believe that employees are entitled to a safe and hazard-free work environment - that's why we're dedicated to fighting for people like you. If you've suffered because of someone else's carelessness or negligence, we want to hear from you. To see what a Personal Injury lawyer from our firm can do for you, call our office today and schedule a free case evaluation.